Jackson Voelkel is a Master of Urban Studies student in the Nohad A. Toulan School of Urban Studies and Planning. 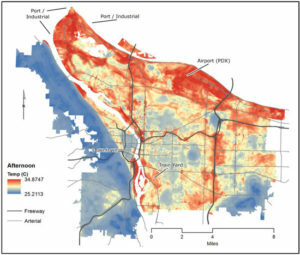 Last year Jackson received an award from the Library’s Open Access Article Processing Charge Fund to support publication of his article “Towards Systematic Prediction of Urban Heat Islands” in the journal Climate. Jackson’s work with Professor Vivek Shandas has already hit the media, garnering mentions in Street Roots and OPB. Because Jackson’s research is published open access, everyone, even those who do not pay costly subscriptions to academic journals, can read and benefit from his work. Way to go, Jackson! Following are Jackson’s thoughts on why he chose to publish in an open access journal. Graduate students work hard. We spend our days ingesting the knowledge of others–their knowledge was built upon those who came before them until the beginning of humanity. This can be an intimidating reflection when our days end and long nights of synthesizing our own thoughts begin. I believe the most difficult part of graduate school is not metabolizing thousands of pages of books and journals, but in finding something new and important to say in light of all of the important ideas that have come before you. From time to time, you find a gap in previous knowledge–this is a rare opportunity to validate your hard work. The act of writing about your new ideas is far less difficult than formulating your ideas, yet the hurdles you must leap begin to change: you have entered the highly monetized world of academic publishing. Though libraries offer fantastic resources in the form of journal subscriptions (made available to their members), they cannot offer everything. You will find yourself on the precipice of the single fact you wish to know to support your claims only to be blocked by a paywall asking for $39.95 in order to read it. Whether it is a publisher restricting access to this knowledge or a scholar being complacent in such a dissemination model, knowledge is becoming a product. Open publishing can help us course-correct the monied nature of research and support scientific discourse by making knowledge available to more people, giving scholars (and their ideas) greater exposure, and fostering research that is built upon the non-monetary value of a study. Though many researchers belong to a library (whether through a university or public institution), there are many people in the world who don’t. This consolidates knowledge in the hands of those who have been fortunate enough to position themselves in a place where knowledge is highly accessible. In doing so, a wedge is driven further in the gap between the knowledge ‘haves’ and ‘have-nots.’ I would never make a claim that the monetization of academic research is fully to blame for the current anti-science and anti-education undertones becoming more prolific in our society; however, I see the free dissemination of knowledge as a potential way to help alleviate some of the negative sentiment. In a sense, open access publishing allows for a (slight) leveling of the ‘knowledge playing field.’ Lofty ideas aside, there is a very real and grounded reason to allow open access to research: as many universities rely on public funds (and public grants to conduct their research), taxpayers have a right to read the knowledge synthesized with the help of their taxes. Researchers also have strong, practical reasons to favor open access publication: exposure. Any time your research is placed behind a paywall, the chances that others may read it drop. If less people are reading your work, then you have a smaller share in the conversation–you are not being heard. Though, selfishly, this is a critical blow to one’s ego, it also hurts your ability to assert yourself as an expert in your field (maybe, even, hurting your chances of a successful career in academia). Only good can come to a researcher at an individual level if more people are reading their work (unless, of course, you are a dishonest Andrew Wakefield type of researcher). Beyond the individual benefits and self-interest, however, lies a more fundamental and altruistic reason to have your research be more visible: contribution. Contribution to the discussions in your field, contribution to the work of those that came before and will come after you–contribution to the overall body of knowledge that got you to point where you could think of something new. These contributions exists in closed-access publishing, yes, but I hold that is in a more pure, less-monied form: a form that is open in order to build the body of knowledge and science.